Learn about the temperament and personality of the Samoyed. Discover what he's like to live with, his traits and characteristics and how he generally behaves. And look at lots of Samoyed photos. The Samoyed is an affectionate people-dog who will want to be the center of attention. He will crave your attention and will either behave or misbehave to get it, whichever seems to work better at the time. This is an energetic, athletic, working dog who enjoys hiking, herding, weight pulling, sledding, conformation, and agility. A Samoyed needs a job to do. Early obedience training is important because if you don't establish yourself as the pack leader early on, your Samoyed will take on the role. This is an uncannily intelligent breed who thinks independently. They will learn your command quickly but they will also attach their own interpretation to it. It can be especially difficult to train this breed to walk on a lead, because these dogs were bred to pull. The Samoyed is an energetic breed that needs exercise every day. They do best with a fenced-in yard, as they will chase a cat or squirrel that they find interesting. And once they get away, it can be very hard to get them to come back. Be careful that your Samoyed does not dig his way under your fence to escape, because he will. They are very talented diggers and many of them enjoy "gardening" and will dig and rearrange your garden. Some also enjoy eating foreign objects. The "chewing" phase for a Samoyed can last for years. They can be quite mischievous and are famous for the sparkle in their eye and their ability to smile. These are expressive, vibrant dogs who like to stay busy and like to be involved. They are quick-witted and inquisitive and remain playful for their entire lives. They love to play with and be with children. They are gentle with and very protective of children. The Samoyed makes a very good watch dog. He enjoys watching everything and he will bark a warning if something new and exciting is happening outside, whether it's a squirrel or a burglar. However, once the burglar is through the door, your Samoyed will show him to the silverware. 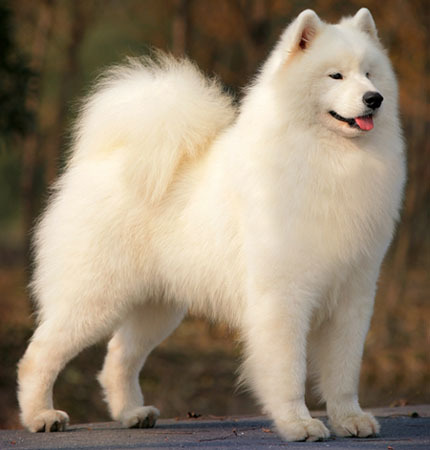 Samoyeds are very vocal and love to bark, yap, yodel, holler, and sing. They truly love the sound of their own voice, but are usually not problem barkers. However, it's really up to your neighbors to define problem barking. The Samoyed is incredibly perceptive of human emotion. Lack of harmony in the home might upset him. He cannot be happy if you are unhappy, and he is known for giving extra cuddles to someone who is sad. They have been known to be extra attentive and loving to family members a few days before those people fall ill. They also seem to know who truly loves them, who just tolerates them, and who dislikes them and will respond accordingly. This is a dog who needs to be with you all the time, everywhere. Lonely Samoyeds are known for chewing the hair off their legs and tails. They need to be with you to be healthy. They will want to ride in the car with you and sleep in the bed with you. They are trusting, loyal, gentle, and loving. The Samoyed is intelligent and quite easy to train. He learns new commands quickly at an above average rate. The Samoyed is a very heavy shedder. He sheds an awful lot of hair! You'll find hair all over your home, stuck to everything! You'll probably even find it in the butter!